An artist and a group of medical students have created a stunning artwork from cardboard. James Lake began sculpting as part of his recovery after losing his leg through bone cancer aged 17 and he now uses cardboard to create intricately detailed life-size sculptures. The sculpture portrays an anatomical torso, complete with meticulously detailed muscles, spinal cord and face. Students at Exeter University's medical school worked with Mr Lake to create the sculpture's cavity, including internal organs and elements. 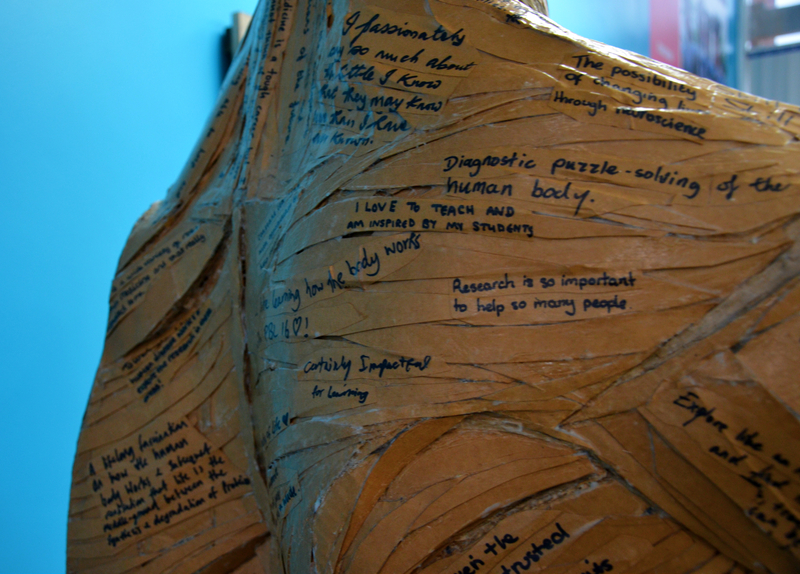 Staff and students wrote messages to express their learning, ambitions, and their wish to inspire future students, which were then incorporated into the sculpture, as part of the skin. 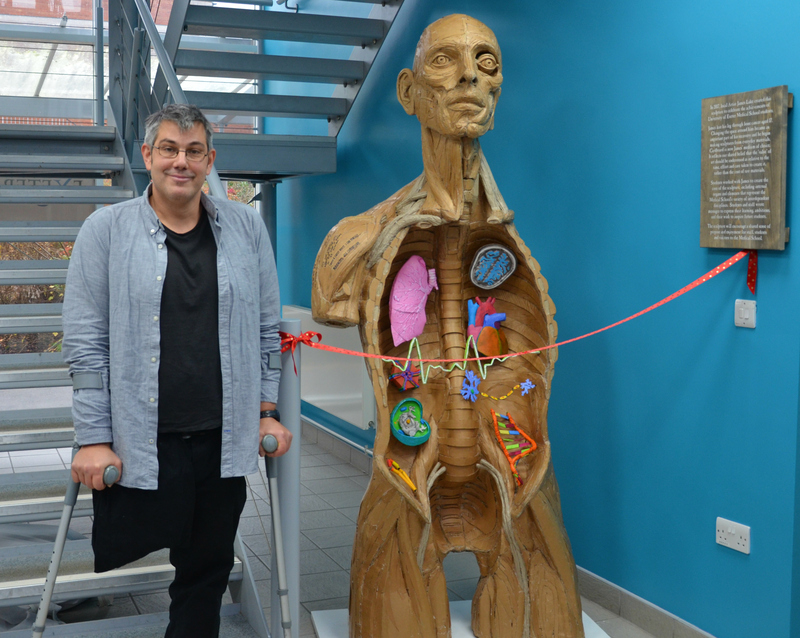 The sculpture, which is over 7ft tall, was unveiled on Wednesday and is available to view in the medical school foyer. Mr Lake, from Exeter, said: "It was a real privilege to be part of such an exceptional learning environment. "Whilst working with the students I realised how much the diverse disciplines interlock to create new avenues for the development of medicine in the future. "The journey of the project, from the initial idea to finished sculpture, has shown the importance of strong core values that can be transferred from teacher to student for the benefit of wider society." Dr Stephanie Bull, a senior lecturer in the medical school, said: "It's been a pleasure to work with such a talented artist on this project. "The sculpture makes an excellent addition to the foyer, and I'm thrilled that James has created a piece of art that reflects the wonderful staff and students that we have here. "Our teaching ethos brings together small groups of people to find the best solution to a particular issue, and this project has applied the same principle to making us more human and accessible as a medical school. "The sculpture will encourage a shared sense of purpose and enjoyment for staff, students and visitors to the medical school." "Studying a scientific subject can mean our creative sides can sometimes feel slightly neglected, so it's fantastic to have this sculpture displayed in the medical school. "The sculpture will serve as a good reminder of the beauty in what we are studying."